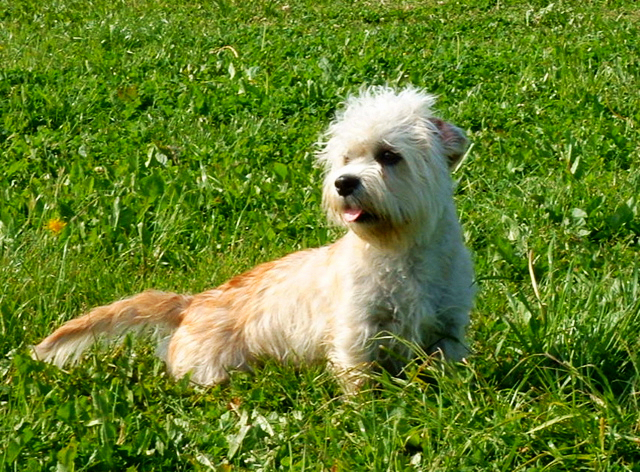 The Dandie Dinmont Terrier is a cute, lovable little terrier. Full grown they are usually about 10-12 pounds with a soft wavy coat and big head!! The Dandie Dinmont is an excellent family dog and great with children. I have worked on very few of them but what I do know is that the owners usually tell me that the dog follows one person around the home. Like a lot of the terriers, they are adaptable to a lot of different home environments and do well in city or country living. Dandie Dinmont dogs are docile yet still have the pizzazz of the terrier group. They are very good with children but they should be exercised on a leash; otherwise they become wanderlust or will chase after birds or whatever crosses its path! The Dandie Dinmont is a healthy breed of dog but can develop eye problems and, due to their elongated shape, back problems like a dachshund. It is a shame that this breed is not more common. It is a kissable, lovable little dog suitable for almost all personality types and home environments! Learn more about the Dandie Dinmont on Animal Planet’s® Dog Breed Selector.